Fyodor Dostoevsky is among the four or five greatest novelists of the nineteenth century and his masterpieceThe Brothers Karamazov is for many critics the greatest novel of all time. He was the quintessential Russian who devoted much of his writing to the peculiar nature of Russia, yet he was one of the most international writers of the whole century. He traveled widely. He lived in several countries. He spoke and wrote five languages including English. He read the work of every important novelist in England, France and Germany and was as comfortable in French as in Russian. When he died in 1881 at the age of 59, all of Russia was plunged into a grief that is normally associated with the passing of a king or queen or other national leader. He was buried in Tikhvin Cemetery at the Alexander Nevsky Monastery in St Petersburg. Forty thousand mourners atteneded his funeral. On October 30, Fyodor Dostoevsky was born in Moscow to Mikhail Andreyevich, a surgeon, and Maria Fyodorovna. Dostoevsky's father was a doctor on the staff of Moscow's Hospital of St. Mary. Mikhail was a very cold, demanding and stern man. Dostoevsky's mother was a gentle saint who was totally subservient to her difficult husband, but gave the children her total devotion and left to them an image of Christian generosity. Family life for the huge Dostoevsky family was very difficult. All nine members of the surgeon's family lived in 3 cramped rooms within the hospital complex. But even in this limited physical environment the doctor maintained an upper class set of values with very demanding educational goals set for the children. Doctor Dostoevsky taught the children many of their lessons himself. The family lived an intensely intimate life together with outsiders excluded. Thus Fyodor was extremely attached to his brother Mikhail but very uncomfortable with strangers. The family had no outside life. They lived together, ate together, studied together. It seems that this was the way the doctor wanted it. He was extremely tyrannical and wanted to dominate every single minute of his little private unit. The children had no outside friends. They never went out. They never did anything apart from the family. On the other hand, with such a huge family there was a lot of fun and good times and Dostoevsky remembered his family life as an almost idyllic happy time. Other family members contradicted this image pointing to the tyrannical rule of Doctor Dostoevsky. With his wife dead, Doctor Dostoevsky now placed the younger children with an aunt and retired to a small country house he owned. As an overlord of the property he was absolutely impossible. He was cruel with his serfs and in retaliation they murdered him. Fyodor was extremely shocked and affected for his whole life by this event. He could not speak of it and never mentioned it to anyone ever again. But the event reverberated in his life and work and certainly inspired the character of Fyodor Karamazov. At his father's death, Fyodor inherited a small amount of money. He quit the military academy. He started to live a wild and profligate life: gambling became his passion, especially billiards for money. Dostoevsky had written Poor Folk now friends intervened and got it into the hands of a publisher. Like Byron, Dostoevsky a had huge youthful success: He is published to great acclaim at age 25. Dostoevsky was arrested as a member of radical socialist Petrashevsky circle. December: mock execution. Messenger arrives with commutation of sentence from the Czar. Dostoevsky is sent off to four years penal servitude in Siberia. Horrible imprisonment (described in Notes from the House of the Dead). "And I consider those four years as a time in which I was buried alive and closed in a coffin. How horrible that time was I have not the strength to tell you, dear friend. It was unspeakable, interminable suffering because every hour, every minute weighed upon my soul like a stone." (Mochulsky, p. 147)Has only the New Testament to read. He reads it incessantly. Undergoes conversion. Gives up his radical socialist ideas. Becomes convinced Christian(Russian Mother Church). "Before all things, humble yourself, consider what your past life has been, consider what you may be able to effect in the future, consider how great a mass of meanness and pettiness and turpitude lies lurking at the bottom of your soul." Dostoevsky is now sent to Siberia to complete his sentence serving as a private in the Russian army. "I do not complain. This is my cross and I have deserved it." Dostoevsky meets the already married Maria, begins affair. Her husband dies and Dostoevsky proposes marriage. Marries Maria Demetrievna. Friends get his sentence reduced and allow him to return to St. Petersburg. Settles down with wife and stepson. Starts journal Time with brother Michael. Publishes own works in journal. On April 15, 1864, his wife Maria Dmitrievna died after an excruciatingly painful illness suffering with tuberculosis. Dostoevsky recorded the moment: "Just now, at 7 o'clock in the evening, Maria Dmitrievna passed away, and wished you all a long and happy life (her words). Remember her with a kind word. She suffered so much during this time, that I don't know who could refuse to be reconciled with her. "(Mochulsky, p. 260). 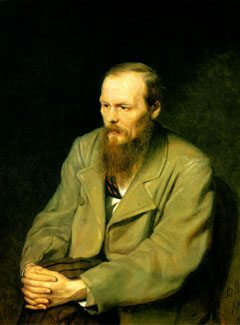 Dostoevsky pressed with debts and with a publishing contract requiring a book by a certain date, hired a twenty-year old young woman named Anna Grigorievna to be his stenographer, In one month he dictated the whole of the novel The Gambler. Anna remained his faithful partner in family and work for the rest of his life and brought order into his writing and his publishing. On Feb. 15, Dostoevsky marries Anna Grigorievna. He is twenty-five years older than Anna. Dostoevsky writes his greatest works. Dostoevsky begins work on The Brothers Karamazov. Work on the novel is interrupted by tragedy in the Dostoevsky family. Little three-year-old Alyosha, his father's favorite son, dies suddenly of an epileptic seizure. Anna tells us about the event: "Fyodor went to bring the doctor, returned terribly pale, and knelt down by the sofa to which we had moved the tot so it would be more convenient for the doctor to examine him. I also knelt down next to my husband; I wanted to ask him what precisely the doctor had said (As I found out later, he had told Fyodor that the final agony had already begun); he motioned me with a sign not to speak. . . And what was my despair when suddenly the baby's breathing stopped and death came. Fyodor kissed the child, blessed him three times, and began to sob. I also wept." (Mochulsky, p. 571-72.) Thus the character of Alyosha in The Brothers Karamazov is born in the instant of the death of Dostoevsky's own most beloved son. He thus endows his Alyosha in the book with all the love he had for his own son. Dostoevsky dies. At his death he had achieved extraordinary fame and success. His funeral was an occasion for one of the most remarkable demonstrations of public feeling ever witnessed in the Russian capital. Quotations in the above are taken from Konstantin Mochulsky, Dostoevsky, His Life and Work (Princeton University Press, 1967).